Find out how you can watch the all electric Fia Formula E racing series online, live and for free from any location. FIA Formula E is an all-electric racing series which started in 2014. All of the races are run on narrow street circuits which creates an exciting atmosphere. Luckily, viewers in the UK can catch Formula E races live for free this season. Normally these live streams are unavailable to viewers outside of the UK. However, anyone can access the free UK streams on using a Virtual Private Network (VPN). That means that as long as you have a streaming device, you can get access to the UK’s free Formula E live streams. The first Formula E race is in Hong Kong On March 10th. No driver or team has taken a clear lead from the first three rounds, with different drivers and teams winning each round. Fans won’t want to miss Round 4 in Mexico City, however, as that may well change, especially given the changes the Gen2 Formula E car has brought to the sport. Competition has been fierce so far this season but the 2017/2018 champion Jean-Éric Vergne is unlikely to sit back and watch his opponents take his title. This year, you can watch Vergne and other drivers compete in the Formula E series free on YouTube. Please note that the methods we are recommending are all official. You may come across unlicensed streams for major sporting events like Formula E. However, these are largely inferior. Sometimes the stream is choppy and may even drop out before the completion of the race. Watching these unlicensed streams is not worth it, especially with a free and legal option available. To watch Formula E races for free online outside of the UK, you will need a VPN. VPNs mask your internet traffic, protecting your identity online. By connecting to a VPN server you can prevent everyone, including hackers and even your ISP, from tracking your online activity. With VPNs, you can also access geographically locked content like the FIA Formula E championship. We recommend ExpressVPN for streaming Formula E since it provides fast streaming and has more than 2000 servers globally, including several in the UK. Moreover, it is also capable of unblocking Netflix, Hulu, Amazon Prime, BBC iPlayer and other streaming services. Registering with ExpressVPN is fast, and and you can start streaming Formula E and any other geographically-locked content in minutes. All you need to do is pick a subscription length (1, 6 or 12 months). You’ll have a 30-day money-back guarantee with a full refund if you decide to cancel during that window. BEST VPN FOR FORMULA E:ExpressVPN is our #1 choice. It offers a fast and reliable network while providing best-in-class security and privacy and excellent customer support. Plus it can unblock most streaming sites we’ve tested it with. The 30-day money back means you can try it risk-free. First, sign up for a suitable VPN service. We briefly addressed ExpressVPN above, however, NordVPN and CyberGhost are excellent and affordable alternatives. Next, download the corresponding VPN app to your device. 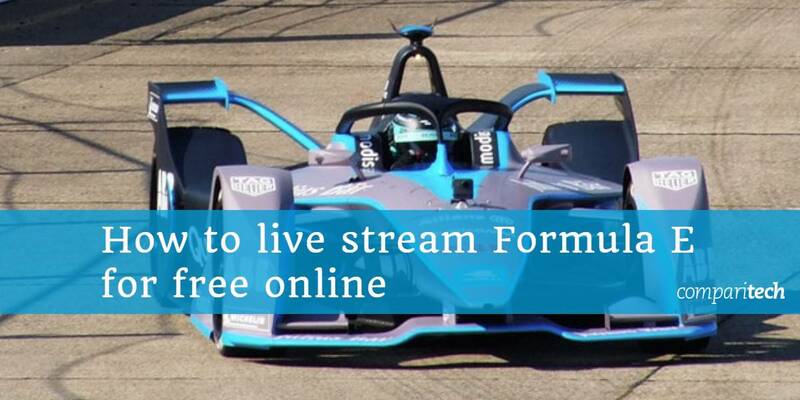 Access the Formula E YouTube page, and select the live race stream once it becomes available. It’s a good idea to test to see if your VPN is working well with UK servers in advance to make sure you don’t run into issues connecting during the live event. This will give you time to contact customer support if things don’t work correctly, minimizing the risk of missing parts of races. Note that if you are watching Formula E, despite the lack of a verification method, if you live in the UK you should have a valid TV License. Where can I watch Formula E for free online? As stated earlier, Formula E is broadcasting the 2018-2019 season free on YouTube for UK motorsport fans. The BBC also acquired the rights and will be broadcasting free-to-air through BBC Sport and on the BBC iPlayer. If you’re outside of the UK, a VPN connected to a UK server will unblock British YouTube channels and the Formula E page. If you’re a UK citizen traveling abroad and you have a valid TV license, you can also use the BBC Sport or iPlayer apps or stream through your browser. In all cases, you’ll need to make sure you connect to your VPN first to get the streams to work properly. Can I use a free VPN to stream Formula E? Free VPNs may seem attractive on the surface but we discourage their use. Since these services are free, they are usually overcrowded with users. You can expect slow connection speeds and a poor streaming and browsing experience. In many cases, these free services can’t unlock geographically restricted content, making them unsuitable candidates for users outside of the UK who want to watch Formula E on YouTube or through the BBC’s digital broadcasts. Free VPNs most likely aren’t transparent in how they operate and often collect and sell user data to make money. Most reputable paid services indicate that they bill users for their service. However, many free VPNs earn money discretely. They do this with obtrusive ads which pop up everywhere, interrupting users’ browsing experience. Some free VPNs even store tracking cookies in your browser. This allows them to collect data on users’ browsing habits which can then be sold to third parties. This essentially compromises your privacy. Trustworthy, legitimate free VPNs are hard to come by. Some free providers go so far as to sell their idle bandwidth for malicious purposes. By using a free VPN, you even run the risk of installing malware injected into the free VPN’s code. Even if you do come across a malware-free provider, there’s a good chance that the service will be substandard, opening you up to the possibility of DNS leaks and unencrypted network traffic. In order to give yourself the best protection while streaming online, we recommend you go with a reputable VPN provider that doesn’t store logs and has a proven history of protecting its customers’ privacy. If you want to watch Formula E directly from a TV network, the following options have broadcast rights in their respective countries. If you’re in the UK, you can watch Formula E on BT sport or Eurosport 1 if you already have a cable subscription including these channels. Viewers in the USA can watch Formula E races on Fox Sports 1 and Fox Sports 2. Viewers in France can watch Formula E races on Canal+Decale, Eurosport 1, or Canal+Sport. Viewers in Sweden and Denmark can view Formula E races on Eurosport 1. Viewers in the Philippines can watch Formula E on Fox Sports 3 SEA. Viewers in Turkey can watch Formula E on Eurosport 1. 3 Where can I watch Formula E for free online? 4 Can I use a free VPN to stream Formula E?